Witness China's highlights as we travel across this vast country with locals on public transport. From ancient sites in Beijing and the Great Wall to the lively and modern streets of Shanghai, experiencing the 'real China' in between. Our tour begins today in Beijing. Today offers a chance to explore something of a city that has been at the centre of China, politically and culturally, since the days of Kublai Khan. You could pay a visit to the impressive expanse of Tiananmen Square, the vibrant heart of Beijing, covering some 40 hectares and enclosed on all sides by memorials to the past and present. You could also visit the magnificent Forbidden City, the one-time home of the Ming and the Manchu (Qing) emperors and a treasure trove of eastern wares. So named, because for 500 years it was off limits to all but a privileged few, the Forbidden City is the largest and best-preserved collection of ancient buildings in China, covering an area of some 720,000 square metres and containing an incredible array of some 800 buildings. We can make a visit to Jin Shan park situated to the north of the forbidden city. The hill here is said to have been built using the spoils excavated from the forbidden city over 600 Years ago. A climb to the top will reward you with panoramic views across Beijing and the 999 1/2 rooms of the forbidden city. A stop at the Temple of Heaven is also considered a must as it is considered to be a high point of Ming architecture. You might like to take a trip out to the Summer Palace, the old summer residence of the emperors, which contains an extensive garden complex full of impressive imperial buildings and a large boating lake that comes complete with a magnificent marble boat built by the Empress Dowager Cixi. This morning we drive 90 km north of the city, to a particularly well preserved section of the Great Wall at Mutianyu, where two kilometres of restored majesty gives us something of the idea of this immense structure in all its grandiose glory. Begun 2000 years ago, the Great Wall of China snakes from the east coast to the Gobi Desert, stretching for over 5,000 kilometres and crossing five provinces and two autonomous regions. Meandering across an undulating landscape of folded hills, the wall at Mutianyu was started by the Northern Dynasties during the 6th century, with much of the restoration that we can see today being completed during the reign of the Ming Dynasty (1368-1644). Nearly 8 metres high and up to 5 metres thick, the wall provided a formidable barrier along the northern edge of the empire and its 22 watchtowers and enhanced defensive features indicate that this section was of particular importance. These magnificent parapets cross a quite incredible landscape of verdant hills, evoking a sense of wonder in anyone who sees it. Returning to Beijing later this afternoon, the rest of the day is free to enjoy a little more of the Chinese capital at your leisure. After a leisurely morning we transfer to the railway station this afternoon, to catch the overnight train on to Xian. We will be travelling in hard sleeper compartments for the duration of the journey, an ideal way to meet the locals and experience something of the unique eccentricities of Chinese life. Arriving in Xian this morning we walk to our hotel, a short 10 minute journey, after which the rest of the day is free to make the most of China's old imperial capital. The capital of China's Shaanxi province, Xian (Chang'an) served as the imperial capital for 11 dynasties and was the starting point of the Silk Road between Central Asia and Europe. This was the beginning of a journey that spanned an incredible diversity of cultures and landscapes, as goods from China made their way across mountains and deserts, into the exotic kingdoms of Asia and the Indian subcontinent and then into the unknown lands of the west. You might like to pay a visit to the city's Tang Dynasty Big Wild Goose Pagoda, a 64 metre high structure that supplies some quite superb views out across the city. Alternatively, the intimate network of alleys and streets that make up the city's engaging Muslim Quarter are home to Xian's Hui minority people, descendants of 8th century Arab soldiers, and its rambling quarters provide an excellent destination for a day of exploring. Today we visit one of the highlights of not only Xian, but of China itself - the magnificent Terracotta Warriors and Horses who guard the Qin Shi Huangdi Tomb. Considered one of the greatest archaeological discoveries of the last century, there are literally thousands of lifesize warriors guarding the tomb of the first emperor of a unified China. Each figure measures approximately 1.8 metres in height they were believed to be individually crafted to represent actual members of the Imperial Guard. Over 200 Years ago the warriors were armed with actual bows, crossbows, swords and spears, when they were discovered in 1974 the few that still remained were as sharp as they had been when they were buried. We'll travel to the site by public bus and on arrival visit the three excavated pits that hold this incredible army, viewing an astonishing array of bowmen, charioteers and the incredible sight of a thousand soldiers lined up in battle formation before the tomb of the emperor. After our visit we will return to Xian by public bus for a final evening in the city. Walking back to the train station today, we catch the morning train to Yichang, on the banks of the mighty Yangtse. We arrive in the city late this evening and transfer directly to our riverboat by private bus. 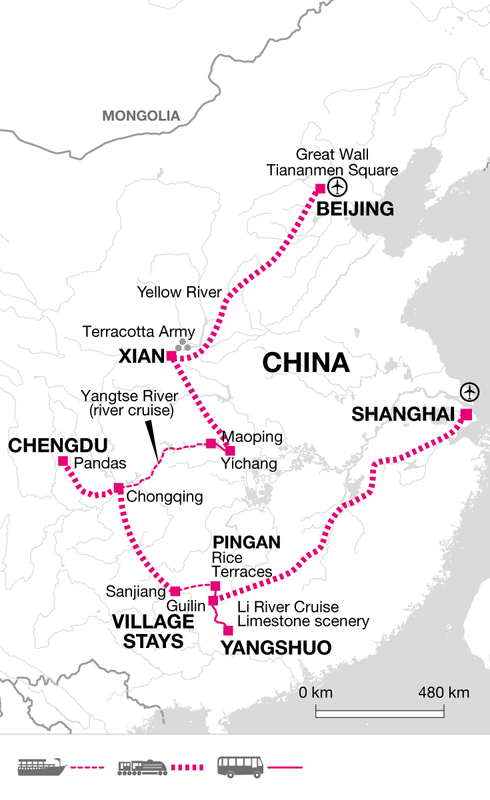 We will spend the next four nights living on the boat, floating down the incredible Yangtse River. Our accommodation is in twin share cabins each with an en-suite bathroom. The boat has a restaurant and bar to relax in during the evenings and plenty of space to relax and enjoy the scenery during the journey. Surrounded by hazy mountain peaks, this mystical section of the Yangtse is steeped in legend and has long been an inspiration for traditional Chinese painters. Departing Yichang this morning we pass through Xiling Gorge, which is comprised of several smaller gorges that run along a 78 km stretch of the river. There will be the option to visit the remarkable and controversial Three Gorges Dam Project, the largest hydroelectric dam on the planet. Our second full day on the boat sees us journeying along the 193 km route that takes us through the fabulous Three Gorges, each one as spectacular as the last. We'll pass from Wu Gorge and into the Qutang Gorge, following the river's course through a landscape hemmed in by towering cliffs that rise up to 900 metres above the relatively calm stretch of water below. There will also be the possibility to watch a film on the Three Gorges and enjoy some fascinating cultural programmes whilst on board. Today there is also the chance to stop and explore Baidicheng, an ancient hilltop temple complex known as the White Emperor Walled City, or explore the Lesser Three Gorges by boat. For our final day on the boat there is the optional morning visit to the shrine of the Jade Emperor, the supreme god in ancient Chinese mythology. In the afternoon there is also an optional visit to the Wuling Rift Valley with spectacular green scenery all around. In the evening you are invited join the captain for a farewell dinner and party (optional). Disembarking the boat in Chongqing this morning, we transfer by private bus to the station to board the afternoon train to Chengdu, the capital of Sichuan Province. Our bullet train should get us in sometime in the middle of this afternoon and, after checking in to our hotel, the rest of the day is free to enjoy as you wish. With a history that stretches back nearly 2500 years, Chengdu marked the spot where the southern Silk Road began and can boast a rich pedigree that includes a reputation as home of some of China's most famous poets the most important being De Fu. It is also considered by many Chinese to be the home of tea drinking culture. It is also a place famed for its cuisine, so be sure to make the most of an opportunity to try some of Sichuan's renowned fare. This morning we visit the Panda Research Centre, to see for ourselves an animal that has become so synonymous with China itself. Operational since 1990, the centre covers an area of some 92 acres and is home to a many Giant Pandas, who roam in their large leafy enclosures. The ultimate aim of the centre is to reintroduce Giant Pandas back into the wild, in such numbers as to ensure their survival, and the centre's nursery has enjoyed a success rate with new-born pandas over the past few years that has been quite extraordinary. After our visit we will return to the city and transfer to the local railway station for the bullet train to Sanjiang. Arriving early evening, we then take a drive to Ma An Zhai, a Dong minority village that lies amidst the forested hills along the Hunan-Guizhou-Guangxi borders. The Dong are just one of over 55 non-Han groups that occupy these fertile landscapes and can trace their ancestry back to the 3rd century BC. We will be staying in a local village guesthouse. This morning we will take a walk down to the village's Wind and Rain Bridge. The Dong are renowned for their architecture, particularly their covered bridges and multi-storey drum towers and this afternoon affords an opportunity to view this beautiful minority style bridge, along with some lovely riverside views. From here we take a stroll through the village, stopping to enjoy a performance of some traditional Dong Singing and dancing. After lunch we will walk though some of the villages and visit some of the families as we make our way back to the guesthouse. This evening we will enjoy some local home-cooked cuisine with our hospitable hosts. After breakfast this morning we'll depart the village and drive on to Longji, where we change to a small local bus for the short drive to the base of the mountains. From here we walk up to the village of Dazhai, our final destination for today. The walk will take around 1/2 an hour and on arrival in the village, the rest of the day will be free to relax and enjoy the spectacular setting. The village is made of some 60 Yao families, who live here amongst a network of stunning rice terraces. Amazing feats of agricultural engineering, the terraces are known locally as the 'Dragon's backbone' and this afternoon affords us some unique opportunities to spend time walking across the terraces, enjoying the extraordinary views over this spectacular landscape. The area is home to both the Zhuang and Yao minorities and we may be lucky enough to come across colourfully dressed women working in the fields during our afternoon's wanderings. Your main luggage will be stored in Dazhai town and you will need a small overnight bag for the next two nights. An early morning hike up to the top of the mountain (about an hour's climb) provides a chance to enjoy the sunrise over the rice terraces, before we return to the village in time for breakfast. Following our meal, we then bid farewell to Dazhai and trek on to the village of Pingan, which is located on the central ridge of the 'Dragon's backbone'. The 5-6 hour hike presents us with some truly stunning views along the way. The last of our village locations belongs to the Zhuang, the largest of China's minority groups, numbering some 18 million in total. Mostly spread throughout the Guangxi Zhuang Autonomous Region they can trace their ancestry back to the Tai, who migrated south from central China some 5000 years ago. With beliefs deep rooted in the power of nature, the Zhuang have long followed a tradition of worshipping the earth, sun and water and many of their festivals reflect this reverence for the natural and spiritual worlds. Skilled in weaving and embroidery the Zhuang have a reputation for producing quite exquisite designs of cotton woven brocades, which has won them worldwide recognition for the quality of their produce. On arrival there should be time to walk around the village and soak up the unique ambience of its rural setting before we settle down for dinner. After a morning spent walking along the rice terraces we then drive to Yangshou, a small market town nestling besides the banks of the Li River. Set beneath a backdrop of towering karst mountains, amongst some of the most scenic landscapes that China can offer, the town provides an ideal spot to relax and break our journey. The sparkling green plain is laced with lakes and rivers, in the midst of which looms a bizarre array of dome-like pinnacles and towers, with such names as Expectant Husband, Mitten Mountain and Mighty Lion Riding a Carp. These stretch into the distant horizon as far as the eye can see, separated from each other by winding ravines and penetrated by subterranean caves - a scene of great romantic beauty. Today has been left free for you to explore at your own pace, the spectacular karst scenery being easily accessible from Yangshou. You can walk into the surrounding karst summits or hire a bike and cycle through country back lanes. It is definitely worthwhile to get off the beaten track and cycle through the rural area around the karst scenery to the small market town of Fuli. If you are lucky you can watch the locals filling the Fuli ferry with their local produce to sale. Stopping to visit the rural villages on the way down, you may like to continue on a circuitous route back to Yangshou, passing through the myriad of small hamlets that dot the landscape, perhaps even taking a raft trip from Hongqi to Shengdi, before finally returning to the hotel. Alternatively, you can just relax and soak up the atmosphere of this beautiful riverside town, or try your bartering skills in the local market, a bustling collection of colourful chaos that sells everything from batiks and silk paintings to copies of Mao's Little Red Book. Today we take a private bus to Guilin, a journey of around one and a half hours, we then board a train on to Shanghai, an overnight journey that gets us into the eastern coastal city tomorrow afternoon. We will again be travelling in hard sleeper compartments. Arriving in Shanghai at the city's South Station this afternoon, we then travel by underground train to the main station, from where we walk the short distance to our hotel. Shanghai began life as a fishing village in the 11th century, but by the end of the first opium war it had become one of the five newly opened treaty ports, a factor that saw it grow into one of the most cosmopolitan cities in the region. Here was a city filled with cabarets and ballrooms, fine shops and satirical newspapers, steeped in the cultural influences and traditions of Asians and Jews, Russians and Europeans. Little wonder then that it was dubbed at the time, the Paris of the Orient. Today is free to enjoy Shanghai at your own pace, perhaps taking the time to wander along its famous waterfront and take in the elegant reminders of the city's graceful past amongst the historic buildings of The Bund. Another option is to pay a visit to the Yu Yuan Gardens, rightly considered one of Shanghai's most famous sights. Founded during the 16th century by the Pan family, they survived the destruction of the Opium Wars and the occupying French, to stand today as a magnificent example of Ming design. If time allows you might even like to take a sightseeing cruise on the Huangpu River, the ideal way to gain an altogether different perspective of Shanghai's impressive cityscape. This evening there may be an opportunity to see the city's world famous troupe of acrobats (optional). Our trip ends in Shanghai this morning. Summer Palace - 40 Yuan entrance fee plus 120 Yuan to arrange a private bus if required). Birds Nest Stadium - 50 Yuan to visit the outside of the stadium and for photo opportunities. Temple of Heaven - 35 Yuan. Forbidden City - 60 Yuan. Kung Fu performance - 240 Yuan. Wild Goose Pagoda - 50 Yuan. Cultural Perfomance and Dumpling Banquet - 300 Yuan. City wall by bike - 100 Yuan. Yangtse Cruise Boat. All optional excursions during the cruise require a minimum number of participants so we cannot guarantee that they will be available on every journey. bike hire - 10 Yuan. raft from Hongqi to Shengdi - 250 Yuan. Sound and light show- 260 Yuan. Acrobatic performance - 280 Yuan. Yu Yuan gardens - 40 Yuan. In the hotter months you will need to pack accordingly with light weight shirts and tops. In the earlier parts of the year it can get very cold so jumpers and fleeces are recommended. Comfortable shoes and sandals. If participating in rafting or visiting the jungle, old trainers (as they get wet) are useful. One main piece of baggage and a daypack. Please note that there is a weight restriction of 7kg for hand luggage/daypack for international and internal flights. As we will be using a lot of public transport it is important that you can easily carry your own bags. Soft shell bags/backpacks are easier to manage than hard cases. It is recommended to take a padlock for flights in and around China. On Day 14 your main luggage will be left in Dazhai town and you will need to use your small daypack as an overnight bag. This is to avoid having to trek with large bags. You will be reunited with your main luggage on DAy 16 before driving to Yangshou. You will need a good insect repellent, suncream, sunglasses, sun hat a small torch and a personal water bottle. Although entirely voluntary, tipping is a recognized part of life in this region of the world. Some local staff look to members of the group for personal recognition of particular services provided. Accordingly you should allow approx. £25 for gratuities for local staff. During the tour we spend three nights on overnight sleeper trains. These are a great way of travelling between cities without losing precious time in the day for exploring with the added bonus that we will get to meet locals as we travel. We use cabins with six bunk beds, three on either side. There are curtains at the end of the cabin for privacy. There is space in each cabin for bags, under the bottom bunk. We suggest a soft duffle style bag or a rucksack as they offer more flexibility than a suitcase.There are toilets in each train carriage, usually Asian style squat toilets although some trains do now have a western style toilet as well. We are likely to be sharing our cabins with non Explore travellers giving us plenty of time to learn about local life during the journey. The majoritiy of hotels in China offer check in from 12noon. On days where we will arrive on a sleeper train the Tour Leader will try and arrange an early check in for the group, however this may not be possible. Please be aware that the beds in China are often quite firm and may take a few nights for you to get used to. This trip provides the perfect budget opportunity to see a great deal of a fascinating country including the must-see sites of Beijing, the Terracotta Warriors, the Great Wall and the Chengdu Panda Research Centre. More off-the-beaten-path places are also included and there is an option of free time at many places, allowing for a more independent approach to your exploration.